These south Austin garden homes for sale include many quality features, giving you unbeatable value in your new home. Inside and out, Gabardine is carefree Austin elegance at its best. 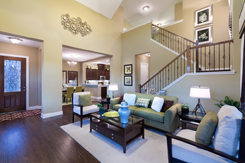 Choose from 5 floor plans ranging from 1856-2303 sq.ft. These boutique condominiums give you the freedom to enjoy everything south Austin has to offer. All exterior maintenance and lawn care is done for you, so you have more time to spend walking the trails through the greenbelt with family, enjoying Tex-Mex at Maudie’s with friends, or just enjoying some relaxing quiet time.